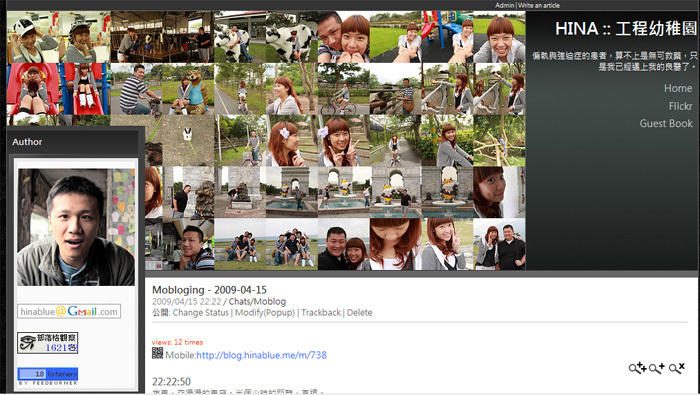 There is the photo skin with your Flickr photos. And this skin need a plugin to set up the photo wall. And there is the skin file. The plugin called "HC_PhotoStudio Skin plugin", you can find in your plugin page. After you enable this plugin, you must input your flickr account(ext. 69875871@N00) in the plugin setting dialog. When you enable and set your flickr account already, change your skin or preview it. This skin test in IE6, IE7, IE8 RC1, Firefox 3, Chrome, Opera 9.